On The Absolute Sound's 'Super Disc' list since dinosaurs ruled. 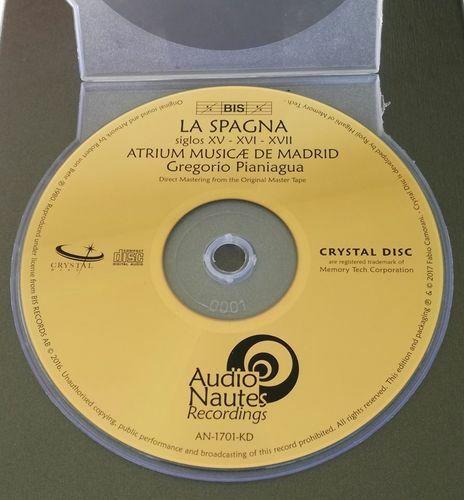 Crystal disc, a revolutionary Compact Disc using glass substrate, this new technology allows sound reproduction at a level previously unknown and is as close to the master sound source as cutting edge technology allows. For this purpose, Crystal disc is fabricated by our Laser Disc technology cultivated over many years with using the best selected materials. ■ The use of glass substrate instead of conventional polycarbonate substrate. As the reflective layer, gold is adopted in exchange for conventional aluminum. ■ For pit transcription, Photo Polymerization process(2P process) using a metal stamper is adopted. This process makes pit transcription highly precise compared with the conventional injection molding process. The technology of 2P process was cultivated by our production of test discs for calibrating industrial optical pick up heads. ■ Surface flatness of glass substrate is much superior to the conventional CD. Glass substrate is hardly influenced by the variation of temperature and humidity. Furthermore, the absence of birefringence coming from the optical uniformity of glass substrate realized signal with extremely low noise and low jitter.